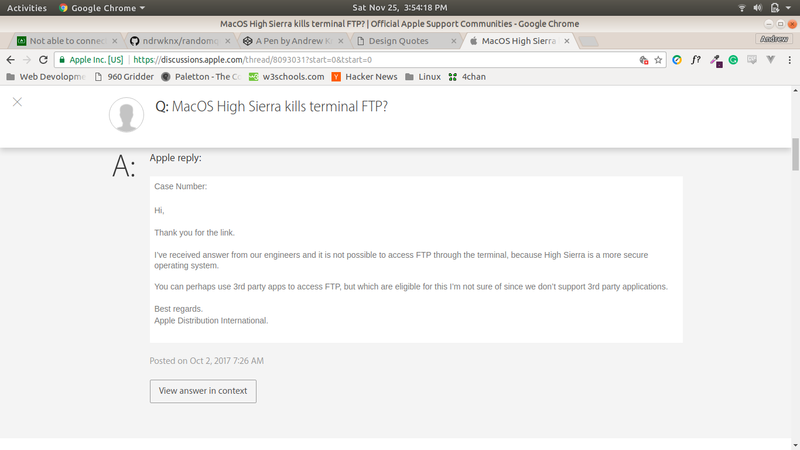 Not able to connect to my FTP server via terminal! Have you tried reinstalling it? If that one isn’t working there are other ones you could download instead. VSFTPD is one for Ubuntu if you’re on that distro. What OS are you running? Also, the greater context of the error message would be helpful as well. Unfortunately, it’s been removed from the OS you’ll need to install some third-party software. Now makes sense…thank you so much… i aprreciate that effort to find the answer… iamKnox… you are really helpfull… thank you so much… for all your helppp!!!.. Absolutely, sorry it ended up not working out! There’s sftp on the command line. Have you considering switching your server to use SFTP (SSH File Transfer Protocol) - it’s not an ideal solution for people familiar with FTP - but if doing things by command line is important to you it’s an option. If you are extremely motivated and up for a challenge you could write your own FTP Client although that option isn’t for everyone.